A trial of Solstice for Windows is typically best conducted with the help of your organization’s IT/AV Administrator. Solstice requires a connection to your network in order to allow users to connect and share content to the display. Ideally, your host PC will be connected via video cable to a display in the room, however, your Windows computer monitor (laptop) can also be used as the host PC for trial purposes only. Please note the trial download link will be active for 72 hours. If that time lapses you will need to request a new trial. Host PC. Install Solstice trial software on a Windows 7, 8 or 10 host PC with DirectX 11 graphics and an Intel i5 processor (or better). Host Network. Solstice requires a WiFi/Ethernet network. In order to determine if Solstice is a good fit for your use case, we recommend you deploy your Solstice trial on a closed-loop network that you control, not on the enterprise network which will likely require involvement from your IT department. For an overview of network deployment, refer to our Network Deployment Guide. Client Devices. Download the free Solstice client apps for Windows, Apple, and Android devices to share and control the Solstice-enabled display. In most cases an IT administrator will be needed in order to ensure that Solstice is properly deployed on your network in compliance with your IT policies. To learn more, take a look at our network deployment guide. Solstice for Windows will need to be downloaded and installed on Windows host PC(s). Create firewall exceptions as needed to allow Solstice traffic. Refer to the Master Ports Diagram. Open the required network ports. Enable iOS mirroring via AirPlay if desired. Enable network encryption if desired. The easiest way to confirm that your trial is working is to connect via laptop or mobile device to the Solstice enabled display (also, see ‘Sharing Content to the Display’ section below). Enter the IP address shown on the welcome screen of a Solstice display into a web browser. You should see a ‘Connect’ button in the middle of your browser once the page loads. Click this button to download the client. Launch the client to automatically connect to the display. Want to set up Discovery? 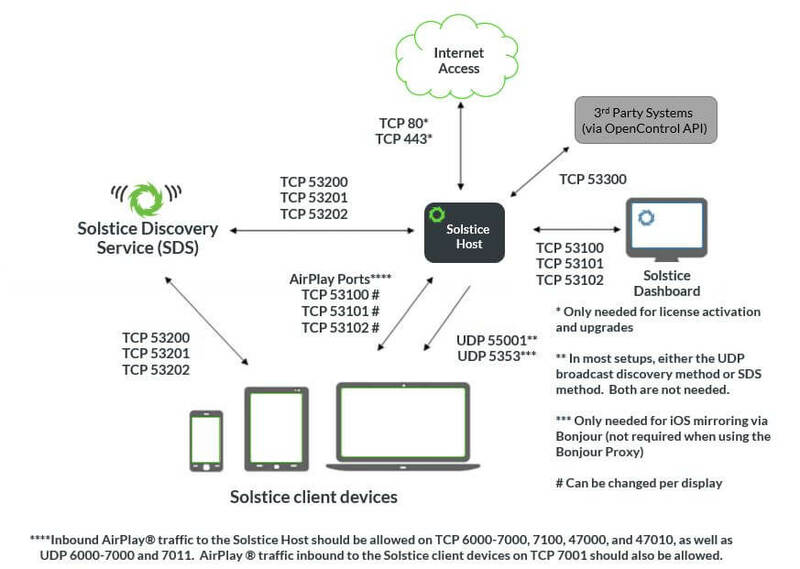 ‘Display discovery’ refers to the ability for a user with network access to ‘discover’ what Solstice displays are available for connection on the Solstice app on their user device. Follow the instructions in the SDS Guide. As an additional resource, check out the network/connection document we have available in our support portal. One thing to note: Solstice instances inherit the network connectivity/access of the Windows PC on which the software is installed. This can provide access to single or multiple networks depending on the network capabilities and access of the Windows host PC. Get the app. First time users will need to download the Solstice App by following the instructions on the display. You can complete this process from any Windows, Mac, iOS, or Android device. Launch the app and share! Stream your desktop, share individual application windows, or share media files stored on your device. All shared content can be controlled from your device. Toggle to the control panel to move and control content on the display using the drag-and-drop user interface. Demo a Solstice Pod – for Free! Do you want to unlock all the enterprise features and functionality of Solstice? You should consider trialing Solstice through our Solstice Pod Demo Program, which will give you 30 days FREE access to our software deployed on a turnkey hardware device. Give your teams the ability to share content to different displays in separate locations as if they were in the same meeting room. Empower your technology and facilities managers to make data-driven planning and budget decisions about meeting spaces.